Inspired by its strawberry pina colada cocktail cousin, this vegan (and, yes, alcohol-free) smoothie is sure to whisk you away to somewhere tropical – at least, in your mind. Feel free to sub orange juice for the pineapple juice if that’s all you have around. Today, I have no story. The kid and the dog are playing on the floor, sort of throwing the tennis ball back and forth. It’s cute. My guy and I have just started house shopping and my brain is reeling a bit from our first excursion out looking yesterday evening. We’ve started packing up this house and it’s already mayhem. And then the daycare I had just started taking my little one to a couple of mornings per week – the daycare that took me months to find, that took me even longer to wrap my brain around, the daycare that my little one was loving, the daycare that allowed me to have a few blessed uninterrupted hours to work on Kitchen Treaty – just fell through. And so I’m processing. Lots of processing. No story, but there is a smoothie. This smoothie makes me giggle because it’s been on the figurative back burner for awhile, and every time I’d mention I need to make one to photograph, my guy would light up. “You know it’s not a cocktail, right?” I’d say. “It’s a smoothie.” I think he’d hear “lava flow” and then the rest would become a buzz. Don’t get me wrong, he’s still a fan of the smoothie, but I think we need to whip up the cocktail that inspired it soon. I believe the last time we drank one was on the patio of an oceanside restaurant on Waikiki Beach. Ahhhh…..
Oh, are you still there? Sorry, sorry. I just closed my eyes and remembered that perfect day. Warm breeze, soft crashing waves, creamy and cool lava flows in our hands. Ahhhh. That was heavenly. I needed that. Thanks. So! 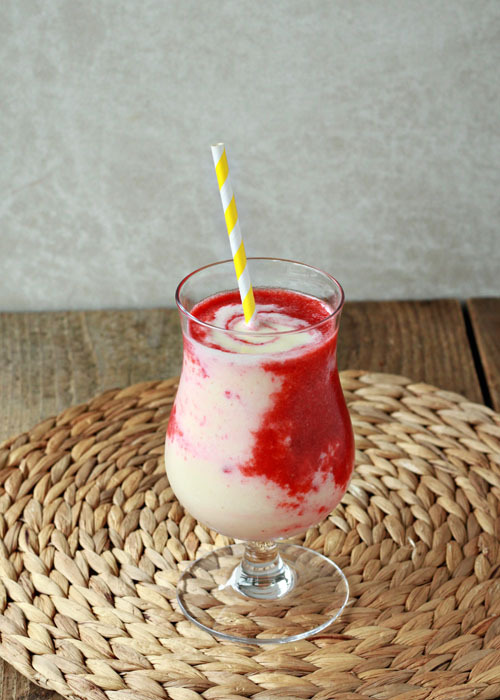 Lava flows are essentially a pina colada with some pureed strawberry thrown in for a little volcanic action (see, the strawberry kind of looks like lava, right?) The combination of strawberry, coconut, and pineapple is pure heaven. Especially in Hawaii. But also at home, and in smoothie form. It’s kind of fun to make, too. But still easy, like a smoothie should be! 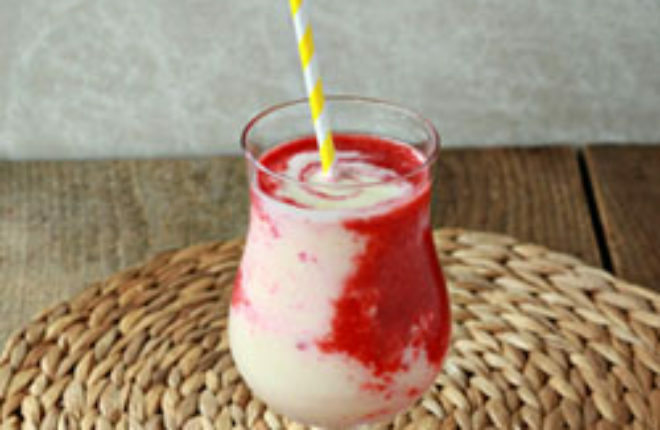 It’s just one extra step – you just puree the strawberries first, pour them into your glass, then whip up the rest of the ingredients and pour them in slowly so the strawberry creeps up the side. So it’s kind of a special smoothie, but still healthy (and vegan!). And the jolt of tropical transport is always a welcome bonus. 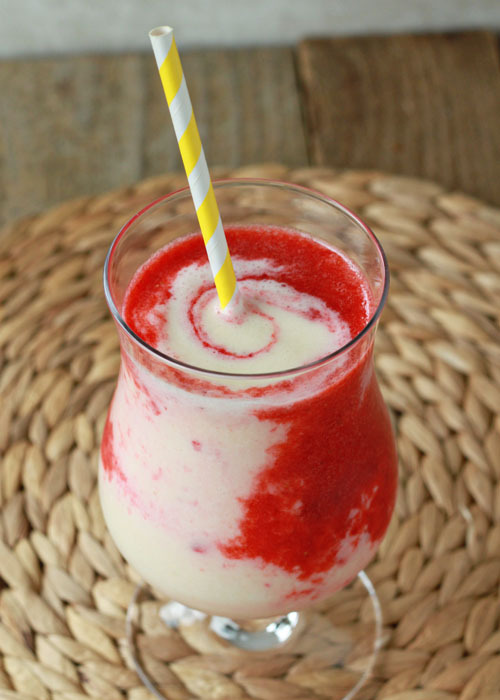 Place strawberries in a blender and puree until smooth. If necessary, splash a tablespoonful of pineapple juice in to get them moving. Pour into a 20-ounce or larger glass. Rinse the blender and components. Add the pineapple, banana, coconut milk, pineapple juice, and ice cubes to the blender. Puree until smooth. Slowly pour the pineapple-coconut mixture into the center of the pureed strawberries. Now THAT is one gorgeous smoothie! Oh yes my friend, i am INTO this! Thanks for the sympathy … and you are totally right, rum (or wine) helps. 😉 So far the looking for houses thing is kind of fun (though absolutely overwhelming) – but I’m still in the honeymoon stage. Daycare … UGH. Oh well. Miss Thing and I will just have a lot more fun together this summer. It must be absolutely delicious 🙂 Strawberries, banana and coconut milk – perfect combination. Good luck with the house hunting! And the daycare situation. Maybe a lava flow cocktail would help? *drools* This looks incredible!!!! I know what I’m doing tomorrow. 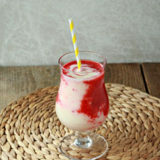 I’m making one of these and lounging on the back deck reading a book while sipping on a lava flow smoothie! Perfect!